BVN COMPANIA DE MINAS BUENAV. I will be the first to admit that I am not an expert on gold nor am I a gold bug. Having dabbled in a gold ETF once I barely got out without a loss. What is intriguing to me, however, is the fact that so many of these companies and ETFs have surged ahead in unison. The last time I saw something like that happen, the sector in question made a strong move upward. Back in mid-July, our list of Swing Trading Signals showed a big contingent of commodity ETFs with BUY signals. Many of them subsequently ran up 10% to 15% in the span of about two weeks. Not bad for a trading gain. With gold and silver stocks and ETFs suddenly showing higher than average volatility and breaking sharply to the upside on higher volume, I am wondering if this time the surge will stick. 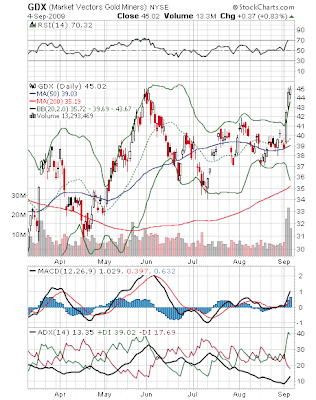 The following chart shows GDX, one of the ETFs listed above. This is as good a proxy as any for the entire sector. You can see that moving averages, MACD and DMI are all moving in bullish directions. The question is, is there enough strength to get beyond the old high at $45 that was established back in early June? RSI and William's %R all indicate that GDX is now over-bought. But the momentum is undeniable. 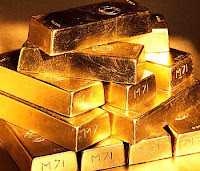 Making a new high this week would go a long way toward vindicating the gold bugs. Over at Market Club, they have a free video that gets into the technical aspects even deeper than I have. You'll need to see this video if you want to know why they think gold is poised to go even higher.